This article is about the 52d Fighter Wing activated in 1948. For the New York Air National Guard unit, see 52d Fighter Wing (Air National Guard). The 52d Fighter Wing (52 FW) is a wing of the United States Air Force stationed at Spangdahlem Air Base, Germany. It was activated in 1948, but derives significant elements of its history from the predecessor Second World War 52d Fighter Group, which is now the 52d Operations Group, subordinate to the wing. The 52 FW maintains, deploys and employs F-16CJ aircraft systems in support of NATO and the national defense directives. The wing supports the United States Air Forces in Europe - Air Forces Africa (USAFE-AFAFRICA), Supreme Allied Commander Europe with mission-ready personnel and systems providing expeditionary air power for suppression of enemy air defenses, close air support, air interdiction, counter-air, strategic attack, and combat search and rescue. The wing also supports contingencies and operations other than war as required. The wing conducts operations at Spangdahlem Air Base, Germany, one of 16 major operating locations in USAFE. The wing is authorized for about 5,560 active-duty members and about 210 Department of Defense civilians. The wing is organized with four groups responsible for operations, maintenance, mission support and medical operations, and has headquarters staff. In concert with USAFE wings at Ramstein Air Base, Germany, the 52d Fighter Wing directly supports the strategic mobility mission once conducted at Rhein-Main Air Base, Germany. The wing provides logistics support for C-17 Globemaster III and C-5 Galaxy aircraft, crew, passengers and cargo to sustain air mobility operations throughout Europe, Africa and Southwest Asia. The 52d Fighter Wing also supports USAFE's Joint Fires Center of Excellence, whose mission is to conduct joint and combined training focused on the effective integration and application of tactical fires. For World War II lineage and history, see 52d Operations Group. 2d Fighter-Interceptor Squadron McDonnell F-101B-100-MC Voodoo Suffolk County Air Force Base, New York, 1965 firing an MB-1 Genie air-to-air missile. Established as the 52d Fighter Wing, All Weather, on 10 May 1948, the wing served in the United States as an air defense unit in the northeastern United States from 1947 until the end of 1968. The 52d was reactivated on 18 August 1955 and designated 52d Fighter Group (Air Defense). It was assigned to Air Defense Command and equipped with F-86 Sabre aircraft. It served once more as an air defense unit in the southeastern United States. In December 1971, it became the host wing at Spangdahlem Air Base, Germany, and inherited tactical squadrons from the 36th Tactical Fighter Wing at nearby Bitburg Air Base. The wing participated in numerous tactical exercises, operations, and tests of USAFE and NATO and provided close air support, interdiction, and base defense operations. It operated with other NATO forces in frequent "squadron exchange" programs and hosted US-based units on temporary duty in Europe. In January 1973, a Wild Weasel defense suppression mission was added. After October 1985, using the F-4 Phantom II model aircraft, defense suppression became the wing's sole tactical mission. In 1987, the 52d acquired F-16 Falcons and became the first wing to integrate F-16Cs with F-4Gs to form hunter/killer teams within individual fighter squadrons. It deployed aircraft and personnel to strategic locations in Saudi Arabia and Turkey in support of the liberation of Kuwait from September 1990 – March 1993. Near the end of 1992, it began receiving A-10 Thunderbolt II aircraft. It received F-15 Eagles in 1994 but lost its F-4Gs. In January and December 1999, the wing supported Operations Northern Watch, Allied Force, and Decisive Forge with numerous deployments to Italy and Turkey. Following the terrorist attacks on the World Trade Center and The Pentagon in the United States on September 11, 2001, the 52d Fighter Wing began preparations for possible combat tasking. Within one month the wing had deployed people and equipment in support of Operation Enduring Freedom in and around Afghanistan. The 22d Expeditionary Fighter Squadron began flying operations at a deployed location in support of the war on terrorism within 100 hours of tasking notification. Personnel assigned to the 52d FW continue to deploy in support of Operation Enduring Freedom today. In April 2010 the wing's strength was reduced by one third. Twenty F-16Cs were flown to the 148th Fighter Wing, Minnesota Air National Guard, one F-16 was transferred to Edwards Air Force Base, California. All aircraft were from the 22d Fighter Squadron. As a result of the drawdown of F-16s, the 22d and 23d Fighter Squadrons were inactivated on 13 August 2010 and formed a single "new" squadron, the 480th Fighter Squadron. On 18 June 2013, the 81st Fighter Squadron was inactivated at Spangdahlem Air Force Base in Germany. The inactivation marked the end of A-10 operations in Europe at that time. In December 2014, the wing commander, Col. Peter Bilodeau, who had commanded the wing for six months, was relieved of his command for "a loss of faith and confidence in his leadership." His deputy served as commander until Col. McFall took command. On 1 April 2017, the 606th Air Control Squadron, Detachment 1 was inactivated at Spangdahlem Air Base in Germany following the relocation to Aviano Air Base, Italy. 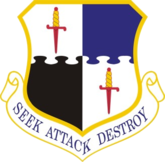 Inactivated on 6 February 1952, personnel and subordinate units assigned to 4709th Air Defense Wing. Redesignated: 52d Fighter Wing on 1 October 1991. ^ The emblem was updated 3 December 1996. It was originally approved for the 52d Fighter-Interceptor Group on 11 January 1951. Robertson, Factsheet 52 Fighter Wing. Its heraldic description is "Quarterly per fess nebuly, first and fourth argent, each charged with a dagger in pale point downward gules, hilt and pommel of the same, grip or; second quarter azure; third quarter, sable." Maurer, p. 115. ^ a b Svan, Jennifer H. (January 22, 2015). "Spangdahlem bringing back former vice wing commander". Stars and Stripes. Retrieved May 2, 2015. ^ Hammermann, Katharina (January 23, 2015). "Welcome back: Neuer Airbase-Chef kennt Eifel schon". Trierischer Volksfreund. Retrieved May 2, 2015. ; (in German) Nuckolls, A1C Dylan (February 5, 2015). "New commander takes charge of 52nd FW". 52nd Fighter Wing Public Affairs. Archived from the original on February 6, 2015. Retrieved May 2, 2015. .
^ Robertson, Patsy (May 7, 2013). "Factsheet 52 Fighter Wing (USAFE)". Air Force Historical Research Agency. Retrieved May 2, 2015. ^ a b Gradishar, A1C Kali L. (April 26, 2010). "F-16 drawdown to begin". 52nd Fighter Wing Public Affairs. Archived from the original on March 3, 2016. ^ Polesnak, 1/Lt Kathleen (August 13, 2010). "480th activated as Spangdahlem's newest F-16 squadron". 52nd Fighter Wing Public Affairs. Archived from the original on February 4, 2016. ^ Knee, SSG Daryl (June 16, 2013). "Fighter squadron inactivation signals end of A-10s in Europe". 52nd Fighter Wing Public Affairs. ^ a b Pawlyk, Oriana (December 30, 2014). "Wing commander relieved of post in Germany". Stars and Stripes. Retrieved May 2, 2015. Ivie, Tom and Paul Ludwig. Spitfires and Yellow Tail Mustangs: The 52d Fighter Group in World War 2. Crowborough, East Sussex, UK: Hikoki Publications, 2005. ISBN 1-902109-43-0.